Plein air artist Arlene Boehm presents a solo show of field sketches, studies and larger studio works in oil. The exhibition is the culmination of her agricultural adventures in Columbia County. 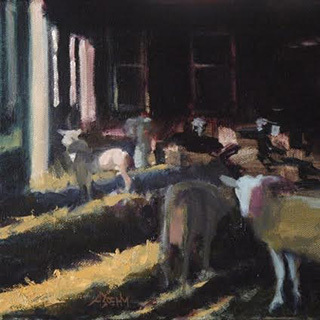 In 2014, in conjunction with the Chatham Agricultural Partnership, Arlene organized season-long painting outings for the Columbia County Plein Air Artists (a group she co-founded with Fran Heaney), at participating farms on the Chatham Farm Tour. The resulting exhibitions––with multiple artists in several venues––celebrated the cause of sustainable agriculture and the preservation of the rural character of our county. FARMLAND 2015 is the culmination of Arlene’s agricultural adventures in the Columbia County: a solo exhibition of paintings. This plein air artist, with the support of the Linda Arnaud Grant (administered by the Columbia County Council on the Arts), presents field sketches and studies and larger studio works in oil. With subjects ranging from rolling fields and meadows at dawn, to raucous chickens and boisterous turkeys in ramshackle sheds and barns, it is all about the beauty of the natural world that surrounds us. Exhibition Dates: Dec. 12,13, 19 & 20, 2015 (Gallery is open Saturdays & Sundays 1pm-5pm), or by appointment. Opening reception: Saturday, Dec. 12, 2015, 3-5pm. For additional information about plein air painting with the group, contact Arlene Boehm at 518-822-9848 or moc.e1555614176lbach1555614176m@ene1555614176lra1555614176.